The boy was motionless on an operating table, his life slowly fading away. His eyes were closed, his face half covered by an oxygen mask and an IV connected to his limp right arm. His father was standing next to him, refusing to give up. He waved at the flies circling his son. He adjusted the wet towel atop the boy’s head, a feeble attempt to lower his high fever. He squeezed his small left hand. In Yemen, described as having the world’s worst humanitarian crisis, a child dies every 10 minutes from preventable causes, according to the United Nations. After three years of civil war, it is hard to say whether the real culprit is disease or the deepening poverty and dire medical shortages resulting from the nation’s upheaval. That emergency grew even more ominous last week when a Saudi-led coalition began an offensive against the strategic port city of Hodeida, almost exactly 100 miles up the Red Sea coast from the town of Mokha. Most of Yemen’s food, fuel, medicine and other essential goods flow through Hodeida, which has been held by the northern rebels who ousted the internationally recognized government backed by the United States and its Arab allies. Alarmed by the offensive, the United Nations and international aid groups have warned that the fighting could choke off these vital imports and, if prolonged, displace hundreds of thousands more people, who could be left to the vagaries of war, want and disease. On an overcast morning a month ago, these three factors conspired against 3-year-old Younous Abdallah. Younous had been sick for days. His family’s village was 30 miles away from Mokha, and no clinics were nearby. More than 270 hospitals and clinics in Yemen have been destroyed or damaged in airstrikes and clashes, according to the World Health Organization. Others have closed because of a lack of funds as the government poured money into waging war. It was not until Younous’s fever soared and he started having convulsions and difficulty breathing that his father, Abdallah Ali Abdu, decided to take him to Mokha, his doctor said. Abdu was too poor to hire a car. So he wrapped Younous in a multihued blanket and transported him by motorcycle. But with the road passing near the front line and too insecure to travel at night, they had to wait until morning. “The locals only bring their cases when in the final or late stages,” physician Abdul Hafith Rajeh said. Abdu first took his son to Mokha’s civilian hospital, but it had no specialists to handle respiratory or chronic diseases. The medical staff had thinned out, because the government had not paid their salaries in a year, according to hospital administrators and staffers. Nor were there any oxygen tanks. By the time he reached Mokha’s military hospital, Younous was not breathing, Rajeh said. The hospital staff managed to resuscitate him. Even at this hospital, there was no ventilator to help him breathe, a staple of any functioning intensive care unit. Nor was there a nebulizer, a device to administer medication into the lungs as a mist. In hospitals across the country, medical equipment is antiquated, inoperative or nonexistent. 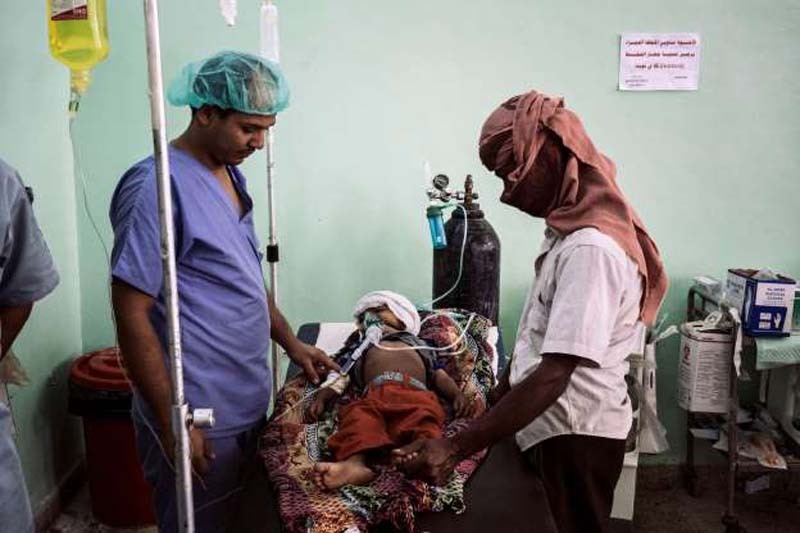 A blockade imposed for two years by the Saudi-led coalition fighting the Houthi rebels disrupted vital medical imports and was eased only in December after international pressure. But bureaucratic delays and armed clashes continue to cause shortages of equipment, medicines and vaccines, the United Nations says. Initially, the medical staff was stumped by the boy’s ailment. They suspected it could be malaria. Blood tests would later lead Rajeh to conclude that Younous was suffering from a viral infection, which, across much of the world, is nearly always treatable in children. By late morning, Younous’s breathing had grown faint again. His chest barely moved. Flies hovered around his face. Abdu felt his son’s head again and then his heartbeat. The boy’s eyes were turning glassy and rolling upward. Rajeh again checked the boy’s pulse. Four minutes later, the doctor adjusted the valve on the oxygen mask in an effort to resuscitate the boy again. Younous’s chest heaved slightly and then was still. His father reached under his son’s blue and gray striped shirt and felt for his heartbeat. Abruptly, Abdu began to cry, breaking the silence in the room. Abdu closed his son’s blank, half-opened eyes and removed the IV from his arm. He wrapped the body in the same blanket he had used to bring the boy to the hospital. He kissed his son on the head and wept. The doctor and nurses watched, showing no emotion. This was not a new sight for them. Abdu took his son’s body in his arms and, without a word to the doctor, carried him outside, through the courtyard and onto the street. Now and then, his sobs rose above the street noise. Abdu mounted his motorcycle but struggled to balance his son’s body. He stood still, unsure of how to take his son home. Hospital officials took notice, and a few minutes later an ambulance pulled out of the gate. In life, an ambulance was unavailable for Younous. In death, one would take him home for his burial.